Zachary is a clever, industrious rat who lives under the floorboards of a bakery which provides him with tasty treats. He is careful never to be greedy, eating only one pastry each day so as not to arouse suspicion. Zachary is content, but he has no friends because he refuses to share his treats. One day a new delivery truck arrives at the bakery. Once Zachary tastes a potato, he is hooked on the taste. He becomes greedy taking more than his fair share and storing them in his lair. 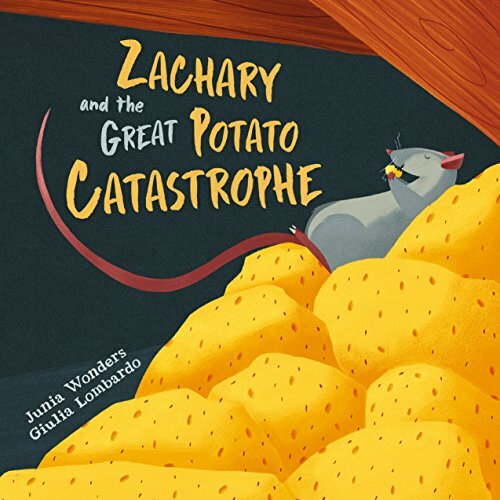 When the baker discovers his potatoes missing, Zachary will be found out. There will be huge consequences to pay. This book is written in crisp rhyme that works well and the illustrations are bright and clever. The weakness lies in the fact that the connection between potatoes and the change in behavior is not explained. No reason is given for Zachary’s decision to change his relationship with fellow rats at the end of the story. This book is a good read-aloud choice or bedtime story for preschoolers and early elementary school readers.